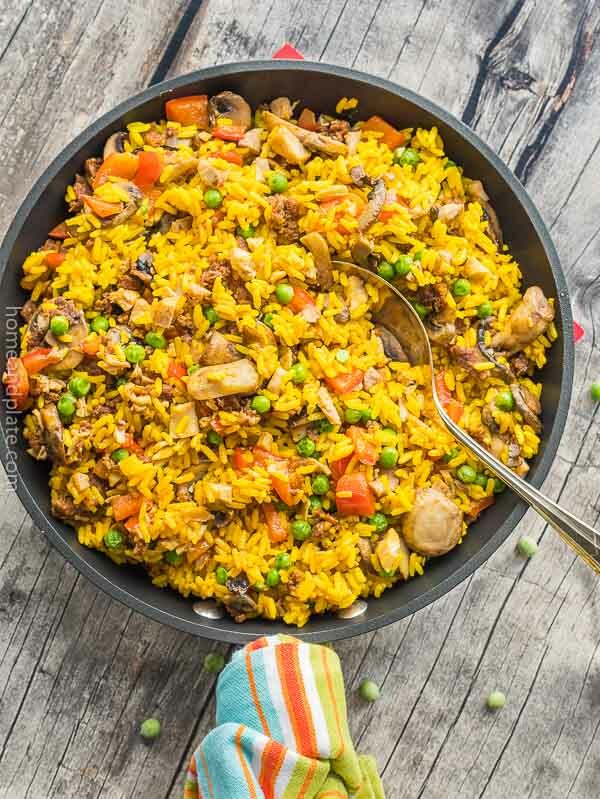 This 30 minute chorizo and chicken rice skillet recipe features spicy chorizo sausage, tender chicken and vegetables infused in saffron flavored rice. Have you ever eaten chorizo? Chorizo is prepared two different ways. This recipe uses Mexican chorizo, which comes raw in sausage link or bulk packaging. Spanish chorizo is sold already dried and cured and ready to eat. It’s delicious, but there’s also nothing better than links of grilled Mexican chorizo sausage off the grill. This spicy pork sausage is full of flavor. 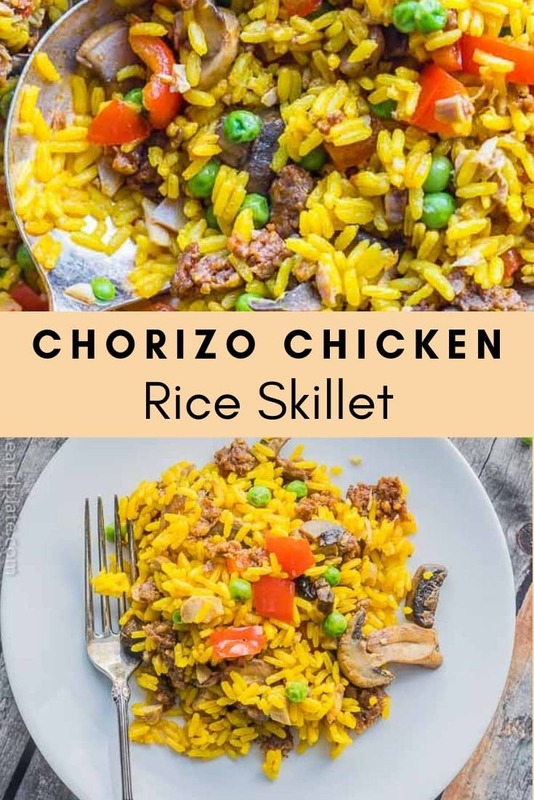 However, for this recipe I used chorizo that is already ground and used it in a rice skillet paired with shredded chicken and fresh vegetables. 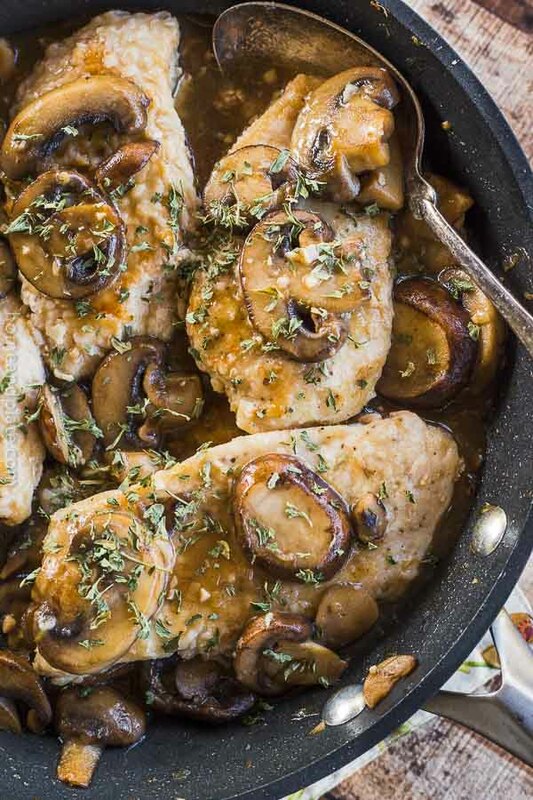 It’s an easy dish that can be on the table on a busy weeknight in under 30 minutes. 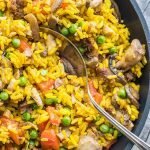 Can Chorizo and Chicken Rice Skillet be made quickly? 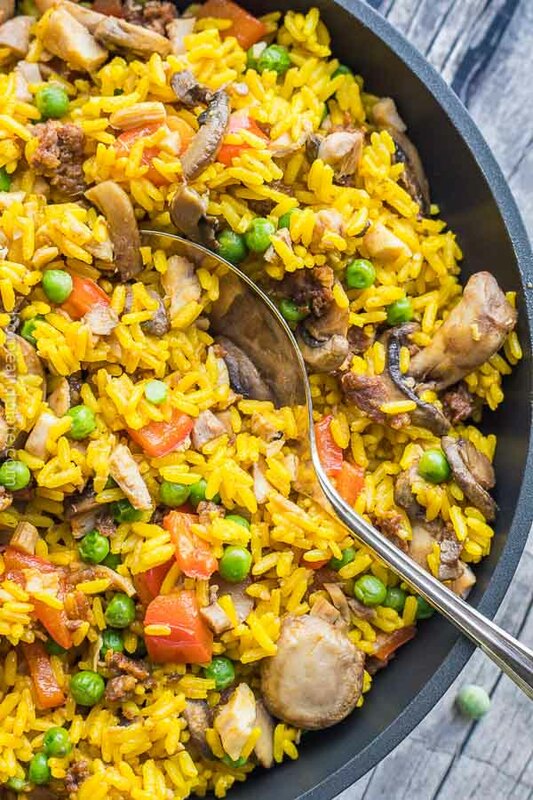 This chorizo chicken rice skillet recipe takes 30 minutes from pan to plate and is sure to please even the pickiest eaters. What’s easy about this recipe is that the chorizo is ready to go, already removed from its casing. 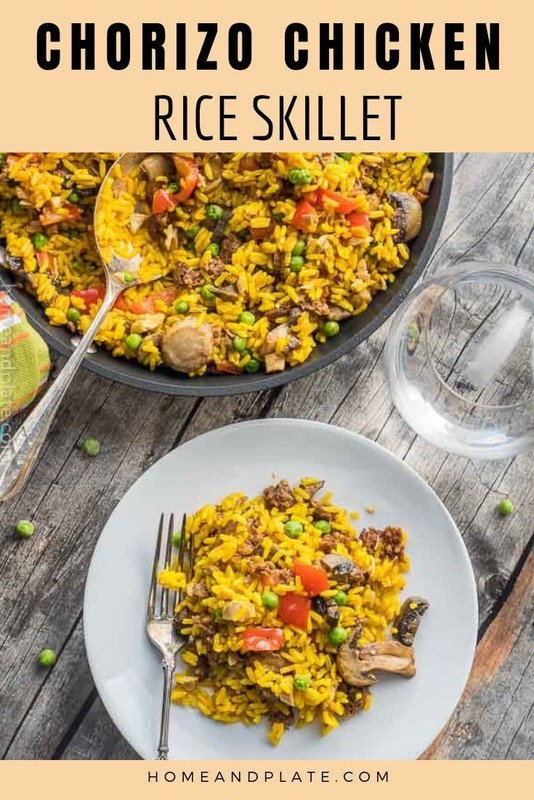 Also be sure to use yellow rice because Saffron flavored rice is more flavorful than Spanish rice and it really infuse this dish with so much flavor. You can find it in the Mexican section of your grocery if unavailable in the rice aisle. I use the Goya brand. To make this quickly, I purchased a rotisserie chicken from the store and shredded the meat. Cooking the chicken is one less step and saves a ton of time. Next, I added the veggies. I had peas, mushrooms and a bell pepper available but any vegetables will complement this dish so switch up your favorites if you want to. Finally, I mixed in the rice and stirred everything together. Serve it to the family and watch them gobble it up! Yellow rice. Goya sells saffron flavored rice in easy to grab packets. Grab one or two. The extra is idea for taco night! Cooked chicken. Pick up a rotisserie chicken instead of baking it yourself for easier prep. Chorizo. The Mexican chorizo sausage is what you want. Bell pepper. Red, orange or yellow is the sweetest. Peas. Pick up a pack of the frozen variety. Mushrooms. I purchase these already sliced for easy prep. Cook the Goya yellow rice according to the package directions. Keep warm until ready to use. Over medium heat, brown the chorizo sausage until cooked through. Remove the sausage from the skillet to a paper towel-lined plate to drain. Wipe the skillet with a paper towel to remove the excess grease. Add the butter to the pan and sauté the diced red pepper and mushrooms for five minutes, until the mushrooms caramelize. Mix in the cooked chicken, sausage and thawed sweet peas to the skillet. Add the rice and heat until all ingredients are hot and ready to serve. It adds a great punch flavor to any chicken dish. Enjoy! What a flavorful meal! I love anything with chorizo! 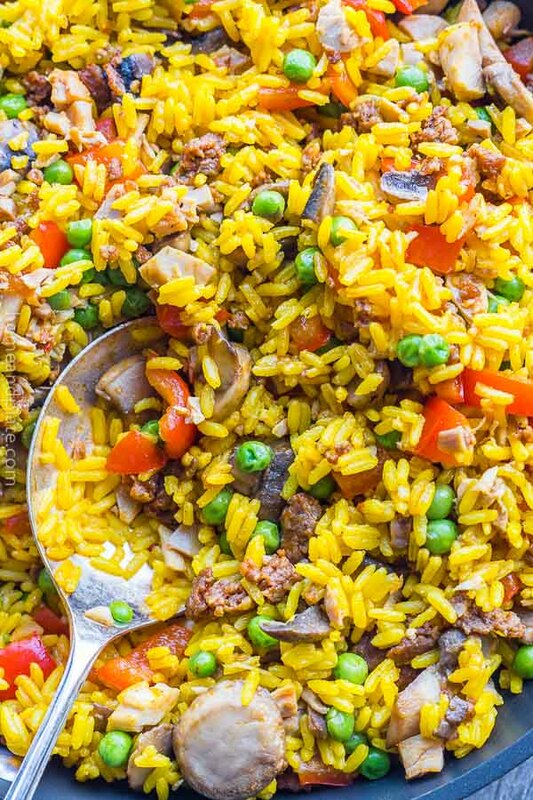 Me too…chorizo or hot Italian sausage is delicious in this rice skillet. I love easy to throw together comfort dinners and this would definitely be a great one to add to the list. Easy to make and everyone will love the flavor. I promise! 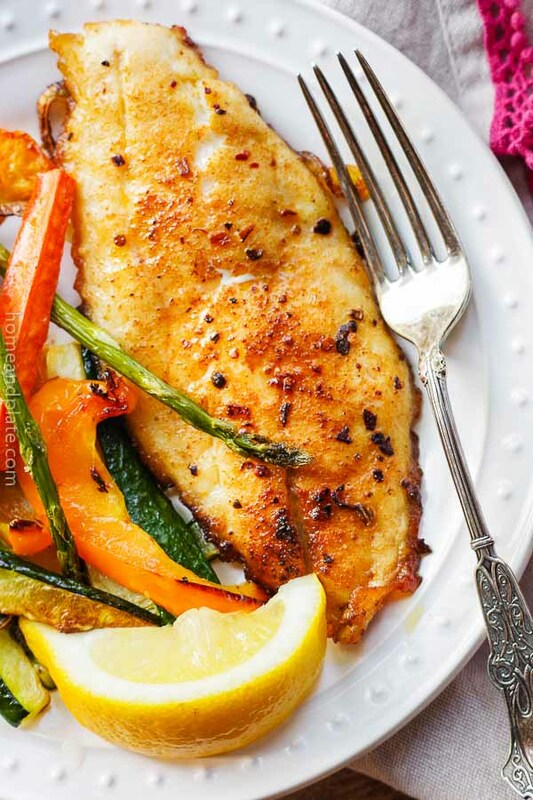 A perfectly easy weeknight dinner, gotta love those. This looks like something my kids would eagerly gobble up. They are vegetable and rice fiends. 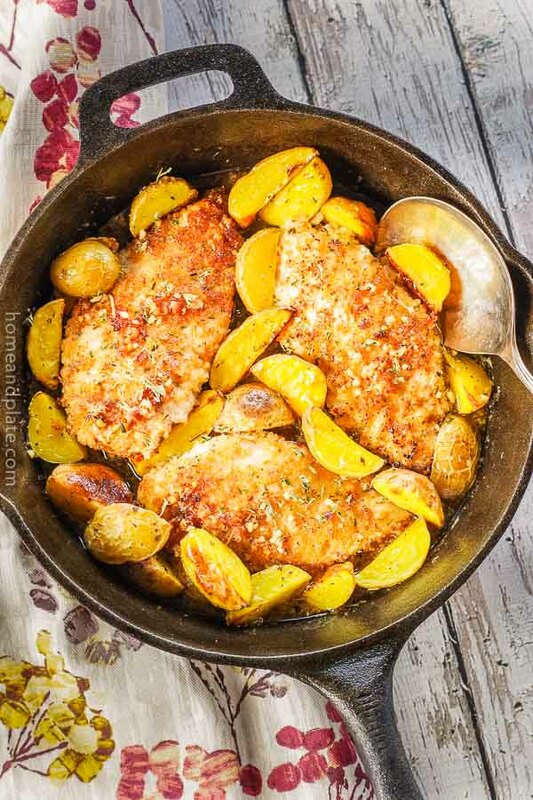 Perfect flavorful and delicious weeknight meal! This makes a great hearty and filling dinner meal. Great flavors too! Thanks for sharing!